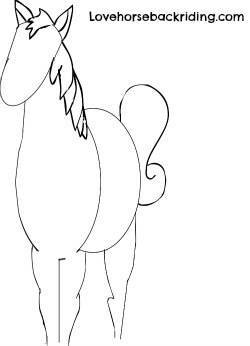 Cartoon Horses - You Can Draw Them by Following These Easy Steps! Cartoon horses are fun to draw and allow us to be creative in a comical way. You are pressing on in this series and about to get more of your outline done. 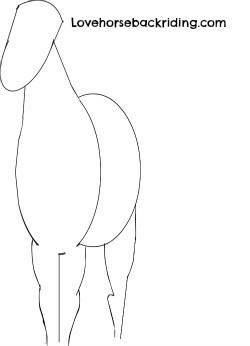 You have already gotten the basic shapes of the horse's body done if you have been following along, we are now on step four. If you just jumped in, click the the beginning button below so you can get galloping up to speed in order! (ii) The lower side to the bottom of the head will also need to be shaped. (iii) Add definition to the legs to represent muscles and joints. As you can see for a cartoon the anatomy doesn't have to be exact. Just create the general idea of the contours of the leg. The bulkier part at the top is where it is more muscular. For cartoon horses this doesn't need to be elaborate. But you can see you can add some dimension and to color it later if you do the insides of the ears as shown. The forelock is the hair that grows down the face between the ears. The mane is the rest of the hair coming off the neck. You can draw it short or long. Some horses have a "roached" mane which means it has been shaved off. To draw that you would just use short lines going up from the neck. This horse's tail is held up proud, has a bit of curl and is girly, but you can do yours how you would like. 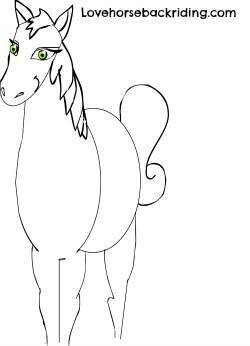 You can see the creativity of cartoon horses shown here by the green eyes, a more human looking eyelid and lashes. Horses have lashes and eyelids but they aren't shaped like this. But that the great part of expressing yourself through a drawing. Two simple long, skinny and tapered ellipses will do the trick here. The mouth is represented by curved line on the face. Time to finish up your cartoon! Click the "next step" button below if you are happy with your drawing. If not, and you want to go back to the last page to try again, you can do that, too.